Initially coal was at the heart of it; now stone provides the only traffic. The apparently simple line from Frome to Radstock and Bristol had a fairly complex history: first just a broad gauge mineral branch from Frome to Radstock; then a standard gauge passenger/goods/mineral railway linking Radstock with Bristol. 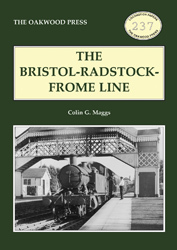 Although the broad gauge Frome to Radstocok branch had been converted to standard gauge before the line to Bristol had opened, through passenger traffic could not immediately be run as the former line was not adapted to carry passenger traffic. The whole line was closed to passengers in 1959, but the profitable goods and mineral traffic continued. In 1966 it was decided to split the branch into two sections: Mells Road to Frome and Kilmersdon Sidings to Bristol. Fortunately the intervening 2.5 miles remained in situ, so when a flood washed away the embankment north of Pensford, the Radstock to Bristol line was closed and Kilmersdon Sidings to Mells Road reopened. Kilmersdon Colliery, the last pit in the Radstock coalfield, closed in 1973. Marcroft’s wagon works closed in 1988 and the branch was cut back to Hapsford Loop where stone trains offered traffic. The Radstock to Hapsford section was retained out of use. The Somerset & Avon Railway Association hoped to reopen it to commuter traffic but did not get the necessary support. A5 format, 240 pages, 296 photographs, etc.